The new deadline is 12 a.m. Pacific Time Friday. More than 1 million people are officially in line to apply for coverage. This story has been updated to reflect the exact extended Jan. 1-start coverage application deadline. Managers of HealthCare.gov have responded to complaints about website glitches and outages, and overloaded call centers, by pushing the application deadline for coverage that starts Jan. 1 to 11:59 p.m. Pacific Time Friday. The current Patient Protection and Affordable Care Act (PPACA) open enrollment period started Nov. 15 and is set to end Jan. 31. 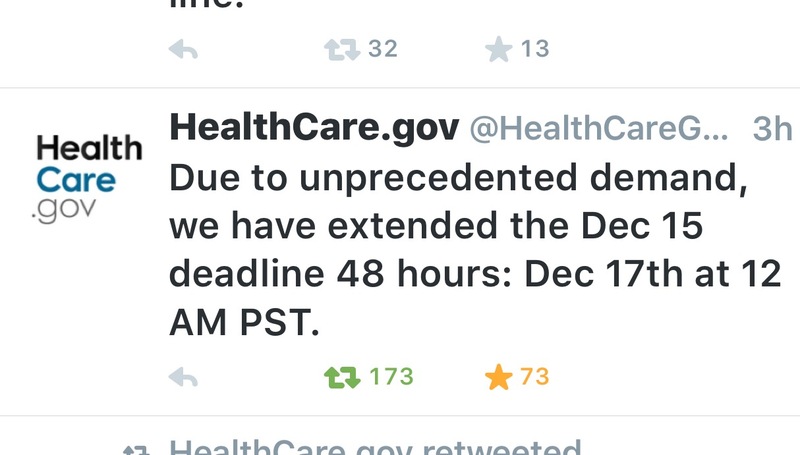 The original deadline for Jan. 1 start coverage was supposed to be at midnight Pacific Time today. CMS officials announced the move around 8 p.m. Originally, they described the new deadline as being at 12 a.m. Pacific Time Friday. CMS officials said that, in addition to the people who have completed the coverage application process, 1 million have officially gotten in line for coverage in the past two days by leaving email addresses with HealthCare.gov and asking for the exchange to contact them. The U.S. Department of Health and Human Services (CMS), the parent of CMS, had CMS set up HealthCare.gov to handle exchange plan enrollment in states without their own public exchange enrollment sites. State-based exchanges can take the same approach or a different approach. Covered California is extending its deadline for Jan. 1 start coverage to Friday, and New York is extending its deadline to Sunday. At press time, Connecticut had pushed its service center’s closing time back to midnight today. The Colorado exchange said it would simply provide extra time for consumers who had started applications before today to complete the applications. Exchange managers, regulators and health insurers developed the open enrollment calendar system to discourage consumers from acting as “free riders” and waiting until they get sick to pay for coverage. Executives at UnitedHealth Group Inc. (NYSE:UNH) recently cited concerns about enrollment calendar administration as one reason that decided to pull back from the individual exchange market in many states. Exchanges and insurers are also hoping a planned increase in the PPACA individual mandate penalty will promote compliance. The penalty is set to increase to 2.5 percent of modified adjusted gross income (MAGI) for 2016, from 2 percent for 2015. For a family with two parents and two children that earns $100,000, or just enough not to qualify for any PPACA exchange subsidies, the penalty for 2016 will be more than $2,000.